If you subscribe to the Vitamix newsletter, then this post will look somewhat familiar. Earlier today Vitamix sent out the annual Mothers Day sale email. Similar to previous years, the sale provides prospective buyers the ability to save on their high end Vitamix blenders. The 2014 Mothers Day sale contains deals on 4 of their top machines, the Vitamix Professional 750, Vitamix Reconditioned Two Speed, Vitamix Reconditioned Standard, and the Vitamix Certified Reconditioned Programs machine. All of these machines deliver the quality and performance you would expect from a company like Vitamix. All of these machines can be used with any of the Vitamix recipes. 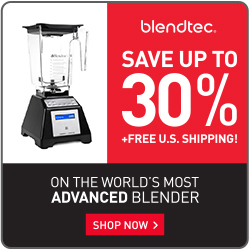 Below is a brief description of the different Vitamix blenders that are part of the 2014 Vitamix Mothers Day Sale. As you can see from the information above, the Vitamix Mothers Day Sale provides you the ability to save a few dollars on some of their best machines. Clicking on any of the links on this page will not only help save you money, but will also guarantee you receive FREE SHIPPING (savings of $25). If you have an problems receiving the FREE SHIPPING, visit our Vitamix Promotion page to verify you are entering the correct code. If none of the sale blenders meet your needs for a gift, then check out the all new Vitamix S30. The all new personal sized blender is versatile, portable, and great for people on the go. If you are unsure of which model to buy, visit the Vitamix comparison page. This page will help you determine which machine is best for you!